“Local Colour” is the name of the exhibition that Deryk and I will have for the month of August in the fabulous Sooke Harbour House. “Local Colour” is an exhibition title that suits us both. 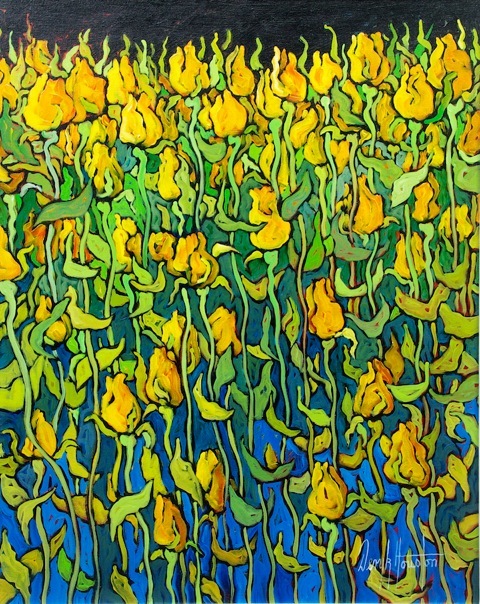 Much of Deryk’s work is inspired by nature and the lush fertility of our great West Coast – he truly does depict the colors seen locally and he has an amazing feeling for movement and vibrancy. See: a web page of all of Deryk’s paintings in the exhibition. 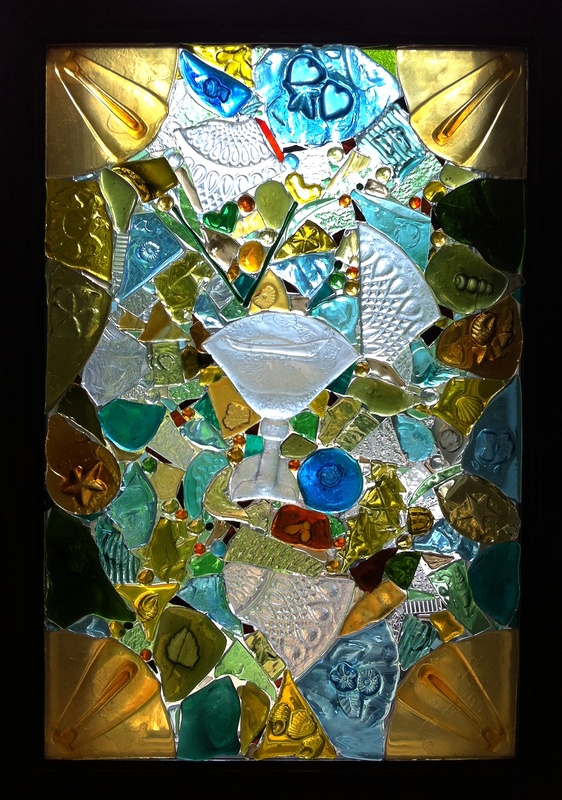 My work is made from recycled glass which I collect from friends, nearby thrift stores and yard sales. 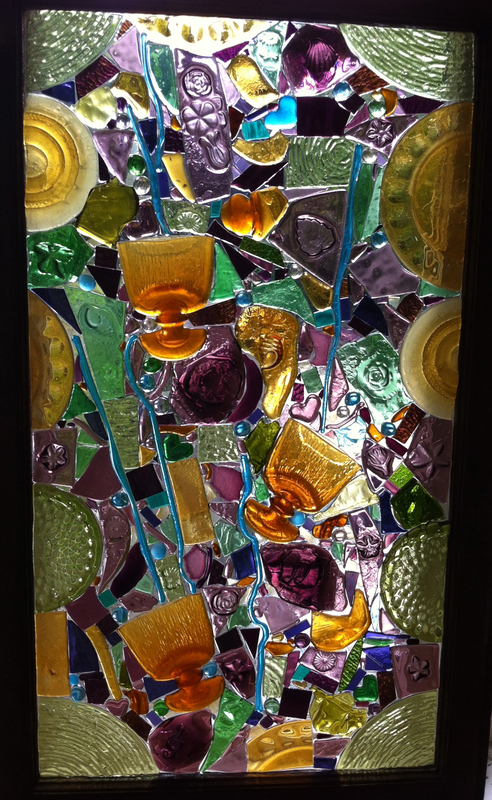 I love broken chunks and I melt individual pieces in the kiln so they are flat enough to adhere to my base glass — windows discarded from heritage houses that I use as my canvas. I think I am preserving some of the local colour as well and I am always inspired by the stories behind the discarded glass. I may not exactly knowthat those now-chipped amber water goblets were someone’s treasure back in 1960, but I can guess that there was a day when they got put in a box and sent to charity. When I flatten them and add them to a mosaic, I feel like I am giving them a new life. I will exhibit about seven or eight glass-on-glass mosaics, including my latest pieces: “Autumn Sonata” and “Thank Your Lucky Stars” (as usual, these are named after movies). This entry was posted on Tuesday, May 29th, 2012 at 1:08 pm and is filed under Uncategorized. You can follow any responses to this entry through the RSS 2.0 feed. You can leave a response, or trackback from your own site.